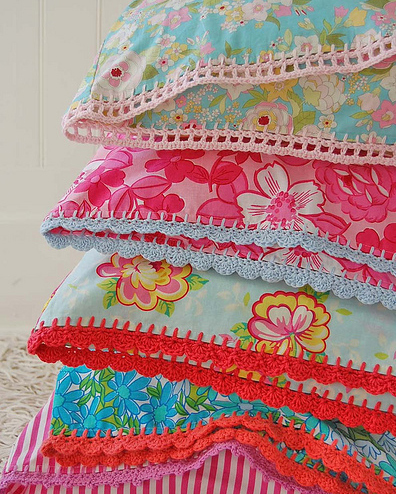 Check out these colorful, winter cheer inducing pillowcases by Beata of Rose Hip. Aren’t they wonderful? Beata started making these in October right around the time she got her hands on a copy of Crochet Adorned, and apparently she has been crocheting up a storm!! I think I would be so happy to walk into my bedroom (or any room!) and see these– and in case you don’t crochet (or sew), she’s selling them in her etsy shop. Her fabric and yarn color combos are excellent, and after trying to match clothes to yarn for a good six months, let me tell you- it’s not as easy as she makes it seem! So, if you’re looking for something happy to give this holiday, check out all of her pillow case listings.She’s even having a giveaway on her blog here, check it out! And if you want to give it a shot yourself– add Crochet Adorned (perhaps a signed copy?) to your list. I also wanted to share the sweetest email I got today about the book, in case there are any crocheters on your gift list. E-mails like this, and seeing what you all come up with, are the reasons why I do what I do. So thank you, thank you! And while I’m at it, here are a couple of links to some other awesome adaptations from the book. Click on over. And, not in the book, but available in the Crafty Tree Trimmings E-book, my Crochet Star Ornaments: Diane’s take! Have a happy, crafty Sunday! oh my god. those are beyond words. the color combos are very soothing to my winter-crusted eyes. Thanks for the sweet words Linda!! So true about what you say about the matching of yarn and fabric -- I'm always on the lookout for yarn -- there never seems to be enough colors for me... Although, I recently found Webs (http://www.yarn.com/webs-kn... which seems to have a pretty extensive yarn selection... I love browsing through this site... Yum! So happy to see that your book is getting such great reviews! I just love the pillowcases! It's the fabrics as much as the trims. I too bought the book and though I haven't done the amount that Beata did with her pillowcases, a few of my friends will be getting Christmas tea towels with a crocheted edging. 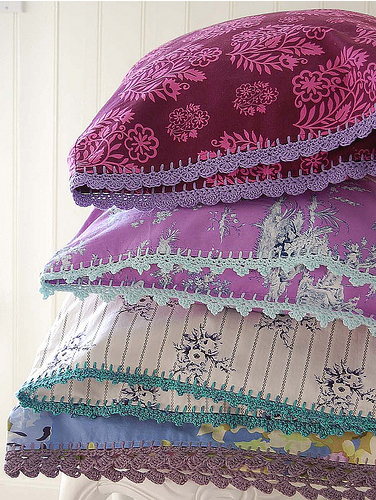 I love those pillowcases. So pretty. I need to learn how to crochet! Brings back another memory of my mom. She used to get the pillowcase kits and would embroider cute things on them and then crochet the edge. Thanks for that sweet memory.